I, like many people who spend hours a day staring at a computer, tend to carry a lot of tightness and tension in my shoulders and neck. If I were rich I’d just get a massage every day. But, since I’m not, I often turn to yoga poses for the shoulders and neck to help me gently open those muscles that get tight from typing for hours on end. 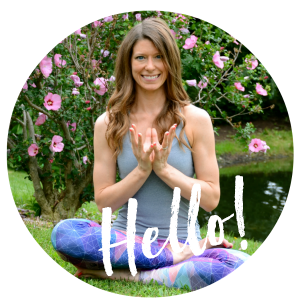 Heart opening yoga poses can be wonderful for helping to pull the shoulders back and open through the chest, so in my own personal yoga practice, I’ll throw in some heart openers with the following poses to help me release the tension in my neck and shoulders. Disclaimer: I am a registered yoga teacher, but I’m not your yoga teacher. Please consult your teacher if you have any injuries or any questions about yoga poses and how to adapt them to fit your body. Flowing through Cat Pose and Cow Pose is a fantastic way to warm up the entire spine. In fact, I always teach it at the beginning of my early morning yoga classes to help my students gently loosen up after they wake up. To practice Cat and Cow Poses, start in a tabletop position with a neutral (flat) spine. On your inhale, gently look up toward the ceiling as you let your belly fall down for Cow Pose. Then, on your inhale, arch your back as you gaze back toward your thighs for Cat Pose. Gently flow between Cat and Cow Poses with your breath, pausing where the stretch feels good. I’ll sometimes even gently press my shoulders and/or hips side to side to get an extra stretch in. At first glance, Puppy Pose may look very similar to Child’s Pose. However, in Puppy Pose, unlike Child’s Pose, you keep your hips stacked over your knees, then walk your hands out so your arms are straight. Think about pulling your chest down to the mat as you pull your shoulder blades together, opening the chest and shoulders. 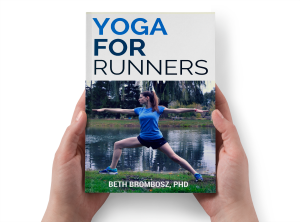 Hold for a few breaths before slowly walking your arms back up to a tabletop position. Thread the Needle Pose is wonderful for helping to open the backs of the shoulders. From Puppy Pose, leave your left arm long by your ear, sliding your right arm under your left armpit. If you’re more open, you may be able to walk your right shoulder further under your left armpit, but only pull the arm under until you find a nice, comfortable stretch. Hold for a few breaths, then carefully come up and switch sides. Eagle is one of my favorite yoga poses for the shoulders and neck, mostly because of the position of the arms. Sitting comfortably, bring your left arm in front of you with a 90 degree bend in the elbow, elbow at shoulder height. Wrap your right arm under the left, crossing your wrists and bringing your palms together to touch if you can. Once you have your arms in position, think about pressing your finger tips up, in the same direction as the crown of your head. You should feel a nice release through the shoulders. Hold on the right for a few breaths, then switch to the left. You can repeat multiple times on each side if the stretch feels good. 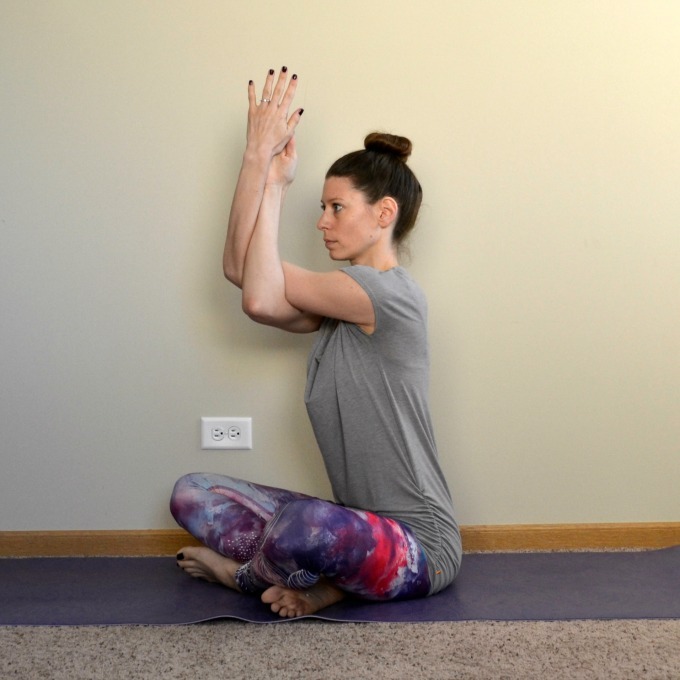 Sphinx Pose not only helps you stretch your neck, but it’s also a gentle heart opener. Start by lying on your stomach, legs long behind you. Walk your arms out in front of you so your elbows are stacked below your shoulders. Press your forearms into your mat, lifting your heart, shoulders, and head. Gently start to pull your shoulders back, stretching the front side of your shoulders and your heart. Be careful not to crank your head back; instead, your gaze should be directly in front of you or just slightly up. Hold for a few breaths, then carefully roll back down to the mat. You can practice this pose a few times in a row, trying to open just a little more each time. Love my leggings? Get your own from Inner Fire Apparel! Use coupon code bethb to receive 15% off your entire order! Do you spend a lot of time in front of a computer, too? Do you have any favorite yoga poses for the shoulders and neck? Love me some Eagle arms. Instant opening of the back and shoulders! I love doing all of those poses! In fact puppy and sphinx are my two favorite poses. Ahh, these are great! I love all shoulder stresses and always need them, it’s always my request when I go to yoga class! Who needs a massage when you have yoga? I love these poses. Your back is so straight! My neck and shoulders have been tight lately so this is perfect. I just tried them and the thread the needle pose felt awesome. Can’t wait to try these…look awesome! I hope you find them helpful, Kathy! Great poses to help this body area, thanks. Leggings are great, but where can I find that shirt? ?